What You Need To Know About Simpson Pressure Washers? Cleaning is a chore most people find to be a tiresome experience. Especially if you are trying to clean something with layers of dirt, like siding, car or mossy patio for example. The dirt you don’t clean can cause additional hygienic problems or damage to the surface. That is why we will focus on presenting you some choices from the Simpson cleaning company. Grime, mold, dirt, mud and even mildew can all be problematic to deal with if you are facing them with only your own strength and regular cleaning tools. Luckily, using a Simpson pressure washer can make this job go faster. Did you know that by using a power washer you could clean your possessions to maintain their value longer? With the Simpson pressure washer reviews that we have prepared, it will be easy to make a purchase based on an informed choice. 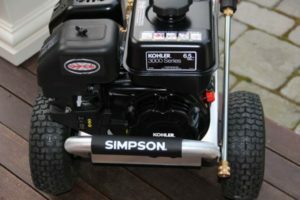 The first review on our list is the Simpson Cleaning gas pressure washer powered by Honda. Since it is powered by gas, power cord length is never going to be an issue. 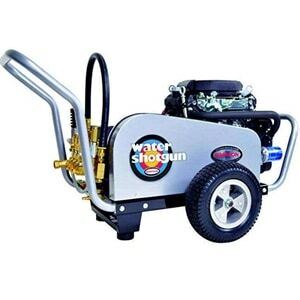 It is a pressure washer meant for commercial usage as its output is 5000 PSI. That type of power can easily handle heavy duty stains on any surface, including cleaning the concrete driveways and even stripping paint from the second story of your house. However, watch out since this type of high pressure can break any fragile surface. The output flow of this unit is 5 gallons per minute, and the total cleaning score is a record 25000! Some noteworthy features of this model are a 20-Horsepower Honda GX620 V-Twin Electric Start Engine, a 50-foot industrial hose, a remote 6-gallon fuel tank and 5 quick connect nozzles. There is also a dual Belt-Drive System which adds to the life of the pump and engine. All of this is mounted on a 10-gauge heavy-duty steel frame with a 10-year warranty. The warranty of the individual parts, however, varies. For a commercial model, it can be assembled fairly quickly. Also included in this model are 13-inch premium tires on “MAG” wheels which allow you to transport the unit over any terrain. With an overall pressure washer weight of 344 pounds, strong and capable wheels are a necessity. Naturally, this Simpson power washer with impressive features comes with an equally impressive price tag. The runner-up on our list has slightly less power, standing at 4200 PSI but still that amount of power makes this Simpson a strong gas-powered cleaning tool. At that level of pressure combined with a 4 gallon per minute output flow, you can wield a cleaning power of 16800. This unit lets you clean your driveway, the ridges on your winter tires and the moldy sidings with one spray gun trigger. This commercial pressure washer comes with a Honda GX390 Commercial Series Engine, an ergonomically designed wand, and comfort grip, and 50-foot hose to allow you a lot of mobility. It’s smart to include a longer hose with such powerful and heavy units. 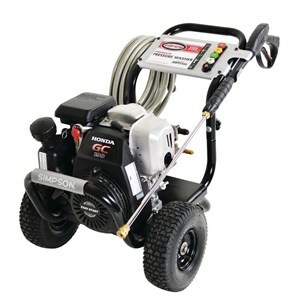 Also, this model includes the AAA Industrial Triplex Pump that is considered to be one of the most durable pumps in commercial pressure washers. All of this is mounted on a heavy-duty steel frame that has been coated against corrosion. Luckily, it’s easy to move it around on two 13-inch pneumatic tires. Even though it weighs around 141 pounds, it is still considered to be a lightweight commercial model which can be used by a single person. The next unit we’ve covered in this Simpson pressure washer buying guide is mostly used for residential purposes. However, packing a 3200 PSI water pressure output, the Simpson Cleaning unit is a more versatile gas-powered pressure washer than the previous two. 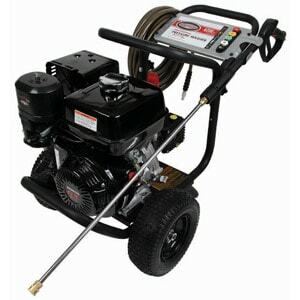 Combined with the 2.5 gallons-per-minute flow you can use this pressure washer for things that are more delicate. The total cleaning power score for this unit is 8000. You can use it on windows, any type of floor, patios, furniture, preparing the house before it is painted, the roof clean-up and so on. This model weighs around 65 pounds. With its compact design and 2 heavy-duty wheels, you can easily store it in a garage or shed. It comes with 5 quick connect nozzles to provide you a variety of choices suitable for your cleaning needs. This model is powered by a Honda gas motor and comes with a maintenance-free axial cam pump. Remember that apart from making sure that the pump is lubricated, you still need to winterize your machine to ensure safe and proper usage in the future. That means proper maintenance and storing before the winter. Simpson cleaning as a company has invested over 50 years into designing and making cleaning solutions. They’ve spent this time making products for commercial and residential usage. Their main focus as a North American company is making gas-powered and heavy-duty cleaning machines for the entire USA market. The gas-powered models we have shown you today in our reviews can be used for most serious cleaning jobs and commercial cleaning businesses. From cleaning trucks to preparing houses for paint jobs, Simpson has covered a wide area of things you can clean with their machines. As a company, Simpson Cleaning has always solely focused on cleaning solutions. They have been around for over 50 years in this industry in North America and have continued to expand their user base even today. They were acquired by the FNA Group Inc. in 2006. The FNA Group brand also includes all of the other companies that produce the various parts for Simpson cleaning pressure washers. Including AAA Pumps, PowerWasher, OEM Solutions, and others. By joining the FNA house, they were able to expand production and sales to cover most of the United States of America. As they have progressed, both do-it-yourselfers and cleaning professionals have continued to use and support this brand of pressure washers. Simpson has a variety of parts and return policies regarding their machines. At the top of the list are the frames themselves. They usually have the longest warranty going up to 10 years with the more expensive models, and 5 years for the less expensive models. They also have special warranties regarding some Honda engines – they can have an extended warranty if they come inside a specific Simpson pressure washer. This extended policy adds 2 more years to your regular warranty. Otherwise, you will only have the standard 2/3-year warranty which is the norm for most models. Pumps, as well as some valves, have a similar warranty as engines, but the company can be nit-picky about what they will cover. Hoses, nozzles and other smaller and easily replaced parts fall under a much shorter warranty. If you happen to have a problem with one of their washers, all you need to do is call a help center and locate your closest servicing branch. Make sure that you take the unit to one of their official service centers, otherwise if the engine or pump gets opened by someone who is not a registered repair provider you will invalidate any and all warranties you have. Once the problem has been identified, it may take a couple of weeks to get the repaired unit, since the company has to send a replacement part. They manufacture all of the parts for their machines. This may be a hassle, but Simpson original parts work best with their pressure washers. As a company, Simpson Cleaning has maintained a steady client base, which is apparent since they have been in the business for so long. They tend to design and make durable heavy-duty cleaning machines. Even the customers claim that Simpson pressure washers are lasting a long time. The fact that they were acquired by the FNA group, which is known as a powerhouse in the pressure cleaning industry, only goes to prove the quality of their service and products. We have covered the most sought-after cleaning units in our Simpson pressure washer reviews so that you can save the time needed for the research, and just choose the best cleaning unit for your needs.